A favorite among many premium pipe tobacco smokers for decades, Lane Limited Pipe Tobacco offers rare and unique blends of the finest Virginia, Oriental, Perique, and Latakia tobaccos on the market today. Each style of this high quality pipe tobacco presented here at our online pipe tobacco store is medium bodied and well-balanced. Lane Limited Pipe Tobacco always delivers a great satisfying smoke to each user, producing room notes that are smooth and aromatic, ending with clean and easy burns. Lane Limited is known as a world leader in the production of premium pipe tobaccos. 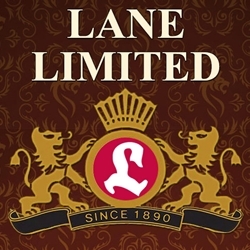 Originally founded in Dresden, Germany in 1890, today all pipe tobacco manufacturing is produced by the Scandinavian Tobacco Group Lane Ltd.
Lane Limited Pipe Tobacco is a premium line offered at an everyday smoker's price, affordable and valued by pipe tobacco connoisseurs everywhere! Try the one of the varieties of flavors listed below. Each of these styles are in stock today at a low discount price! Available in 5 lbs. / 80 oz. Bulk Pipe Tobacco size bags! Call us for more details!